Make Plans to Join The FUN at PLAAY-Dot-CON 2019! 2018 was a banner year for PLAAY Games, and one of the high points was our very FIRST convention, PLAAY-Dot-CON 2018! 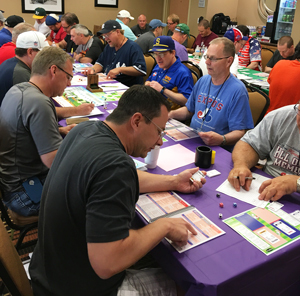 It was three days of spectacular sports board game fun—so much fun, we've decided to do it again for 2019! The 2018 event was super-fun, everyone had a great time! Check out the photos and stories from PLAAY Dot CON 2018! The 2019 con will be even better! We've booked bigger facilities—more than double the space of the 2018 con—and added more organized activities. We'll also get an earlier start on things Friday, and will play into the evening on Saturday. So it'll be a FULL three days of sports board games and related activities. Update 03.25.19: Here's our tentative three-day plan for PLAAY-Dot-CON 2019! PLAAY Dot CON 2019 will be held July 19-21st at the recently-constructed Hampton Inn and Suites in Highlands Ranch. There'll also be an informal "pre-con" get-together Thursday evening, July 18th. Tickets are available right now at a special early-bird rate, $49. Your ticket covers all four days of activities, and lets you compete in any of our organized tournament events, discussion groups and demo sessions, as many as you want! The "Early Bird" rate will be in effect until December 31st. Starting January 1, the advance ticket price will increase to $66. We're planning a full schedule of games and fun, with a fine-tuned itinerary based on what was most popular at the inaugural event. We'll have another HISTORY MAKER BASEBALL Time Machine Tournament, another two-round HISTORY MAKER GOLF tournament, an all-time great HOCKEY BLAST tournament, and organized events for football and soccer. New this year, we'll conduct a head-to-head FACE TO THE MAT "Three-For-All Throwdown" event similar to what we did at the Recruits Convention in Kansas City (complete with another briefcase full of MONEY!) And we'll also be looking for play-testers for some NEW games we're trying out! You can be among the first-ever to play them! "PLAAY Ball! ": Early action in the HISTORY MAKER BASEBALL Time Machine Tournament. Al Wilson (bottom left) looks up a result for his '60 Pirates, facing Randy Coryer's '65 Twins. Meanwhile, Dale Buckingham (L) and Michael Owens were battling it out with the '97 Indians and '94 Expos. PLUS, we'll have a great line-up of special guests, including game designer Mike Fitzgerald (Baseball Highlights 2045, Football Highlights 2052, etc. ), AFR's Steve Tower, and MORE! While we haven't set the specific final itinerary yet, we can give you a basic overview of what PLAAY Dot CON 2019 will look like. THURSDAY EVENING: Informal pre-CON get-together,"burger burn" at Redstone Park. Just a few minutes away from the convention hotel. Burgers, brats, lawn games, fun. Included in your ticket price. 6-9PM. FRIDAY: Registration will start at 10AM (a couple hours earlier that in 2018), along with a sports game "flea market" for early-arrivers. Organized game activities will start at noon, pizza at 5PM (included in your ticket price). At 6 PM, we'll have a special Guest Game Designer panel discussion, featuring Mike Fitzgerald (Baseball Highlights 2045), Grant Fines (49 Football North and South) and Gary Brown (Legends of Boxing, Grid Zone, Quick Fixture Soccer). Then more games 7-10 PM. SUNDAY: All day organized game events and open play, 9AM to 4PM. There'll be "Sunday Golf" with our second annual PLAAY Gamer HISTORY MAKER GOLF Open Tournament—every convention attendee will get their own personalized set of HMG golfer cards, choose whichever competitive profile you prefer: big hitter, magician, irons wizard! There'll also be a Fury Football event where we'll probably play a short season and conduct playoffs and a title game, all in the space of a couple hours! We hope you'll plan to be a part of a bigger, better PLAAY Dot CON 2019! For information about accommodations, you can contact the hotel directly, here's the link to the hotel website. Take advantage of the "Early Bird" ticket rate and save 25%! Purchase your PLAAY-Dot-CON Three Day PLAAY-Pass HERE! If you have questions about the convention, contact us!